Decision making. It doesn’t come easy for many of us. But, there are people who specialize in that. They are the people, who silently help companies take strategic decisions with ease. We have one among them today at your Adda. She is known for her breadth of knowledge and a good critical mind, apart from her decision making skills. Her blog focusses on strategy, technology, investment & lots more. 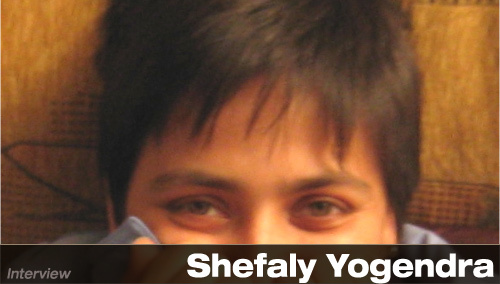 We are extremely happy to have Shefaly Yogendra at your Adda. A Woman with a panoramic mind. Shefaly, for a limited time has given us access to explore the things that are going on in her mind. Here is an exclusive conversation with her. I started blogging sometime around 2004. A friend nudged me till I gave in. My original view was that it is exhibitionism and narcissism at its worst; indeed it wasn’t an ill-founded notion as few blogs then were professional in their aims. However, as John Maynard Keynes said, “when the facts change, I change my mind. What do you do, sir?”, I duly changed my mind and started with blogging about Obesity. My work blog is about strategy at its broadest, although I link that to regulation, investment, technology and sustainability. My personal blog (currently private as I ponder its direction) is mostly about politics and social issues, interspersed with travel, cooking and quirky stuff from my day to day life. The book review blog is of course about book reviews. Very much. Have you seen when I wrote last? I get stuck mainly because I like long form writing whereas the web’s attention span seems to be like that of a gnat on acid. This is a serious mismatch. However, I only get stuck while starting to write; if I begin I keep writing and then my real challenge is editing it down to a reasonable length. Q: MBA, M Phil, CMI Research Fellowship and PhD is all that you have done. That’s commendable! Were your initial ambitions different from what you are doing right now? My “ambition” has always been self-centred. I don’t compare myself with people I attended college or IIMA or Cambridge with. I want to learn. I am driven by curiosity. I want to do things creatively and differently. All these educational labels were right to pursue at the time, because they scratched an itch for me. Engineering taught me problem definition; the IIMA PGDM taught me how to resolve problems knowing there is a resource constraint and the MPhil gave me a reality check on how political agendas often mean the best and the most efficient answer is usually not the chosen one. The PhD has been an indulgent pursuit to bring it all together. My ambition is still the same and the goalposts keep moving, so do I.
Q: You have done PhD in decision making, that is something new to us. Can you explain more about this? Why did you choose to make it your career? Decision making is what we do. Every day. At the beginning of my career, I worked in corporate venturing – making decisions with budget constraints and with enormous freedom and responsibility day in and day out. I made big mistakes, I won some big ones. And as a curious person all I wanted to do is make new mistakes & not repeat the old ones. The PhD came very late in life because I had enough experiential data of my own to go by, by that time. Plus, having worked in many countries’ regulatory and legislative systems, I had larger systemic understanding too. It is my career because if you don’t make decisions, what do you do? Q: “I believe science and technology should seek to improve human life“. How successful this industry has been in delivering the same? Give a few examples that you feel are the most beneficial and some from your wishlist. Mixed outcomes I’d say, like with much else. Among the notable ones is the pill – that gave reproductive choice and freedom to women albeit not unadulterated; as it shifted the burden of responsibility in power-imbalanced relationships to the woman. I also think the pill may have inadvertently contributed to the spread of AIDS and HIV, because it sort of made sheath based protection seem somehow less important. I also think that genetic engineering for efficient cash crops is a great gift, albeit one has to acknowledge the uncertainty of its long term impact on the environment and biodiversity. In the main, I’d say that the naive belief which is widespread, that science is somehow free of normative values needs to be challenged. Society’s framework of morals has an extremely important role to play in whether science improves life, and if it does, then at what cost. For the last part, I’d mention the Tuskegee trials and Eugenics as serious turning points in our thinking. On my wish list are of course – end to malnutrition, prevention of disease and healthier – not necessarily longer – lives for all. Q: It is quite useful to have clarity on why one is on Twitter – this is what you suggested on Quora. You also mentioned how Twitter was helpful in emergency cases like 26/11 and analysed the pros and cons of Twitter. How do you feel it is helpful, apart from emergencies? Why are you on Twitter, and how has it helped you till date? My criteria for following people on Twitter were tweeted and then picked up by @Problogger. At least two of these must be met: informative, interesting, dialectical and original. These sound like simple words, but they are very tough criteria to meet. I started late on Twitter – in 2008. Mainly to learn, listen and converse, and to feed my wide interests. Twitter is still serving that purpose for me. It has helped me get to know several fascinating persons whom I have subsequently met and developed friendships or professional relationships with. It is also a nice add-on to my RSS reader. Q: You have two more blogs – ObesityHeadlines, that talks obesity, its causes, its prevention, etc., and Laviequotidienne on your musings and analysis on a range of issues. What is the reason to keep these blogs as private? What does the phrase La vie quotidienne mean? Share some experiences of blogging here. The Obesity blog was started when I realised that at least 90% of the data I collected for my PhD will never be used in my thesis. And when I knew that, while I had a timeline on my research, I couldn’t help but keep reading. The blog grew to be an interesting multidisciplinary research “village well” and the several thousand hits every day from obesity researchers worldwide weren’t uncommon. It is now private because it has a ton of data and I might sometime write a book using it. Also, not updating a blog is pretty lame so it is behind a wall now. La Vie Quotidienne – French, meaning The Ordinary (day to day) Life. I am reconsidering its raison d’être and hence it is behind a wall. Q: The position of women has unquestionably risen in the past few years. But it is still not what one can be happy with. How do you feel this can be changed? What solutions would you suggest? There are so simple solutions. Before I proceed further, I must state clearly that my brand of feminism is not anti-male or male-hatred driven. Most of my closest friends are men and my closest relationships are with wonderful men including my super-liberal father. For starters, women cannot do this alone. Men have to be active believers, supporters and champions of women’s rights. As such, it is a daily task for us to help men in our lives understand how we experience life daily and differently from them. Because even the smartest of feminist men (and women too!) can often miss the point. Here is a story for you. A very smart, feminist male friend of mine works in international development. He has worked on several tricky problems concerning women. In a conversation the other day, I asked him if he noticed that most “gaalis” directly or indirectly targeted a person’s female relatives, and asked if he had any hypothesis as to why this was. He was stunned. He had never thought about it like that. Whereas for me, when I hear a mother/sister-f***er escape someone’s lips, I always wonder what thought was behind that word. Indeed, it is seen as cool amongst several high profile Indian Twitter women, for instance, to use Hindi versions of these “gaalis” and nothing makes me sadder except to see this totally thought-free practice. Language is important – we claim things via language and it is an important starting point. A trickier point however is for women to stop seeing women’s rights as a zero-sum game amongst women. I hate to say it, but women often make it hard for other women to progress, to grow; this has to change. The sisterhood must recognise that we need a rising tide for all women to make a difference in society. Q: Utplava, your firm, consults about the investment opportunities in India. Can you tell us more about the work you do? In current scenario, what kind of advisory do you provide to your clients, regarding investment in India? I advise on risk assessment and due diligence, not just on India investments. India investments are especially tricky because of our unique and extremely complex political landscape, the close ties between business and politics, our, err, interesting view of governance and malfeasance, and the connectedness of the society in India at large. It is hard to parse all this and keep up to date with it all. That is my special skill – not least because many in business pride themselves on “not doing politics”. I have always had an active interest – if somewhat abstract interest – in observing and understanding political machinations and I do that in several national jurisdictions. The advice is bespoke – which means no cookie-cutter work and I look at things on a case by case basis. So, unfortunately no blanket advice on India right now. Q: Inform us something about the progress and achievements of PowerCuts.in, which was started to crowdsource information about Power Cuts in India. Do you have any plans to make it more beneficial? Where does it currently stand? We are currently working on identifying some ways to expand its scope and to make the data more accessible to consumers and to industry. It is an entirely volunteer-driven initiative which cooled somewhat but with summer around the corner, I think we will rise in awareness again. All I can say is, watch this space. As I am not the only one in charge of its future. Q: You also review a lot of books on Amazon. What genre do you enjoy reading the most? Which are your favorite authors and which books would you recommend reading? I read a lot on decision making, politics, and food. Also poetry. I don’t think I have a favourite author, although at a push I could mention Martin Gardner, HL Mencken, Joseph Epstein, Ruth Reichl as some authors whose work I have enjoyed consistently (some are dead of course). Q: Apart from reading, what are your other interests? You are a passionate baker as well. Do you often get time to follow this passion? I am a baker who doesn’t eat baked goods. I follow the passion for the pleasure of others including friends and family. I am a dedicated Pilates practitioner, museum rat, culture vulture, conversationalist and reasonable cook. I play piano at somewhat-above-amateur skill level. I polish my language skills as and when I get time. And I write – even though my blogs’ poor state will have you believe otherwise! And I watch a lot of films when I can manage. Q: When Shefaly is not at Utplava and blogging, how does she like to spend time with her family? I like peace and quiet, interrupted by walks in the woods, watching films, F1, rugby and one-off drama. London doesn’t let one tire of opportunities either. “No” is the short answer. I seem to have a fairly kind following though – when I blog the link gets shared around pretty quickly and people come to read stuff. I wish I were a more regular blogger though. Very much. And yes I do. Very good. I like Mahendra Palsule‘s blogs very much. I used to love Nita Kulkarni‘s blog which she stopped writing in pursuit of other interests. Nilanjana Roy‘s blog is my great favourite too. I don’t know if you call Medianama a blog but I read it religiously, and I am a great fan of Nikhil Pahwa. I also read Jai Arjun Singh‘s and Meeta Kabra‘s blogs as often as I can. My friend Makarand Sahasrabuddhe writes a great blog on international development. Manu Prasad of course is always reliably funny. Wow I have exceeded my 5 pretty quickly! A bit like my advice to those who want to do a PhD: think very hard. It is not easy to produce good quality content regularly. Know your aims other than propagating your ideas. Engage in conversations (not least because you are not Seth Godin who can afford to not keep comments open!). And be prepared to be challenged (especially if you make a one-sided argument). Oh and don’t try to make it your main income source. I wish! It is a cost centre for me but a source of joy which cannot be quantified in monetary terms. Q: According to you, what is the future of Blogging? I have great hopes for long-form writing. Although the tendency seems to be to read less and less. Yet, I believe there are serious readers out there who will keep high quality conversations alive. TV Show: Have I got news for you! Shefaly, after this interview, we can safely say that you are a role model for many. Your thoughts on Women Empowerment, Science and all the other things that we spoke about are inspiring. Friends, what do you think? Let us talk about this in our ‘Conversations’. Connect with Shefaly: Blog, BlogAdda, Twitter. Next PostNext My Sunglasses, My Style: Winners Announced!